Premium Quality Polythene Poly Mailing Bags, Available in All Colours & Sizes (White / Blue / Red / Purple / Pink / Green / Grey). A3 / A4 Small, Medium, Large Biodegradable Plastic Postal Postage Mailing Mail Shipping Parcel Bags Mailing Bags are widely used for postal, postage, carrier and shipping via courier or on your own. At Wellpack Europe, we provide strongest Poly mailing bags with 40mm Lip seal to cover your items including important documents from being damaged or altered while in transit. Mailing bags comes in various sizes and colours for example, White Mailing Bags, Blue Mailing Bags, Pink Mailing Bags, Green Mailing Bags, Grey Mailing Bags, Purple Mailing Bags, Red Mailing Bags, Baby Blue Mailing Bags, Baby Metallic Blue Mailing Bags. Our Mailing Bags are fully recyclable and easy to use. 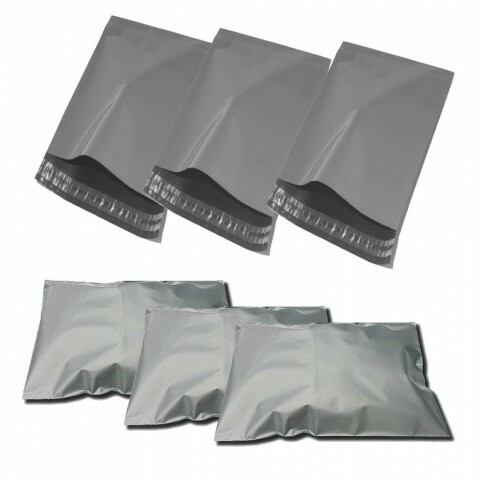 A pack of 100 strong grey mailing postal bags, size 10"x12" (250mm x 300mm), with 40mm 'peel & seel' lips. Perfect for mailing your items at a very cost efficient price. A pack of 100 strong grey mailing postal bags, size 12"x14" (300mm x 350mm), with 40mm 'peel & seel' lips. Perfect for mailing your items at a very cost efficient price. A pack of 100 strong grey mailing postal bags, size 14"x16" (350mm x 400mm), with 40mm 'peel & seel' lips. Perfect for mailing your items at a very cost efficient price.